It’s going to be a busy week in our house. Little Owl is not just in one theatrical production but two. Then Friday is the school fete. It’s my first ever school summer fete so I’m pretty excited! I’m in charge of the Hook-A-Duck stall and have been busily painting signage. 50p a go and you get a prize every time. What’s not to like? Then of course there’s the ash tree seedlings to do battle with. What?! I hear you shout. There is a large ash tree that spreads its canopy over our garden and it is ladened with seeds. It’s a beautiful tree but those seeds are a menace. If you should ever want an ash tree sapling do let us know because they spring up from every nook and cranny. In fact, we could probably start our own ash tree nursery based on our patch alone. With each warm day the threat of this year’s crop casts a darkening shadow over the garden. However, an incident last week did mellow my attitude slightly. One morning a brightly coloured bird peeked in at our back door, swiped some straw from our hanging basket liners, and flitted off up into the ash tree. Do you know what it was? A goldfinch! The bird with the jolly colouring of a clown. And it wasn’t just one goldfinch but five, all clowning around in the seed-heavy branches. So I’ve called a truce with the ash tree, if not with its seeds, and will think of the goldfinches every time I pull up yet another ash tree seedling from the vegetable patch. 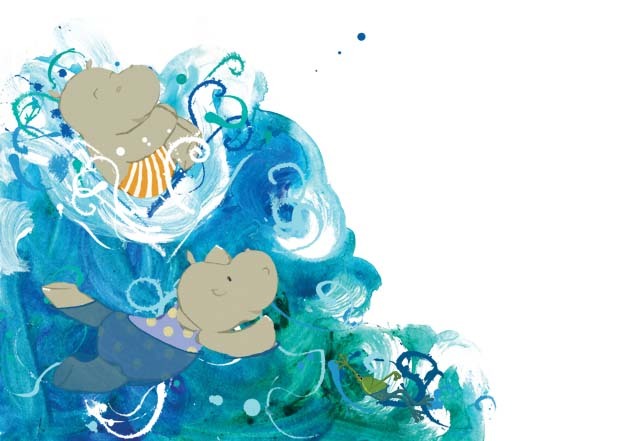 This entry was posted in Growing things, Illustration and tagged ash tree, children, gardening, Hannah Foley, illustration, illustrator, picture book, seedlings, swimming hippos. Bookmark the permalink.